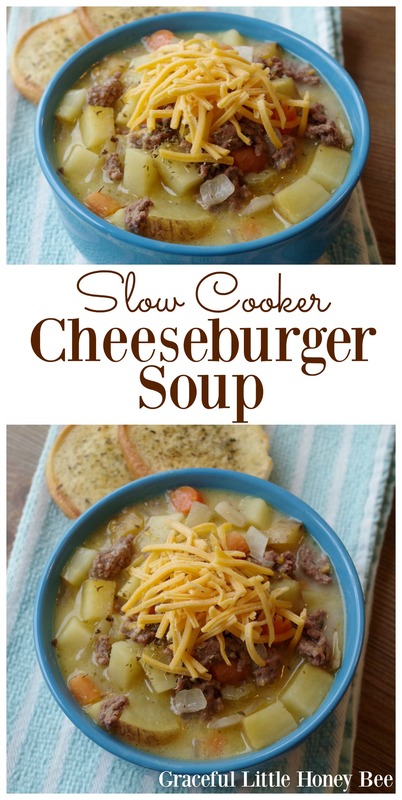 I took advantage of one of the last cool days of spring to make this rich and creamy Slow Cooker Cheeseburger Soup. It’s no secret that I love making soup in my slow cooker because it’s such a fast and frugal dish. Your family will love this rich and hearty soup, especially when paired with a slice of chewy homemade bread. Enjoy! Step 1: Add vegetables, stock, water and seasoning to slow cooker. Step 2: Cook on low 6-8 hours or until vegetables are cooked through. Step 5: In saucepan, melt butter over medium heat. Step 6: Slowly sprinkle in flour, stirring constantly. Step 7: Slowly add milk, stirring constantly until thick and creamy. Step 8: Add cream sauce, cooked ground beef and cheese to slow cooker. Step 9: Cook additional 30 minutes – 1 hour before serving. Add vegetables, stock, water and seasoning to slow cooker. Cook on low 6-8 hours or until vegetables are cooked through. Slowly sprinkle in flour, stirring constantly. Slowly add milk, stirring constantly until thick and creamy. Add cream sauce, cooked ground beef and cheese to slow cooker. Cook additional 30 minutes - 1 hour before serving. Sounds yummy can't wait to try this recipe. My question is since I don't own a slow cooker could this recipe be made on the stove top? Of course! Just cook the veggies in the broth until soft and then make the cream sauce and add the cooked beef, cream sauce and cheese. Simmer 10 minutes or so and then it's done! This is how I would do it if I wasn't using my slow cooker. Could be a lot less calories and healthier with Smart Balance margarine instead of butter and 2% cheese. Also low fat milk and maybe a touch less flour. Otherwise the basics look really yummy! We all make our own choices. We don't do low fat dairy here because we feel whole food (including fat) is better for the body. Have a great day!